CareConnect's clinical functionality, which includes computerized physician order entry and documentation, will be phased into use at the clinics over a 15-month period. It will happen in four groups, from July 2012 to September 2013. (View the ambulatory rollout schedule.) Groups are divided into waves, with a number of clinics scheduled to go live every four weeks. At the end of 13 waves, all clinics will be using the full suite of CareConnect functionality. To get ready to implement CareConnect's clinical functionality, staff and physicians will receive training within four weeks of their clinic's go-live. Each clinic will have a dedicated CareConnect team working with it for eight weeks surrounding its go-live date. The team's focus will be on the remaining clinic-specific content, finalizing order routing, completing a dress rehearsal, training, and providing "at-the-elbow" support during and after go-live. Complexity of specialty documentation and clinics with multiple specialties -- primary care clinics build the foundation of the chart. Technical readiness -- the current landscape of end-user devices/what needs to be done to prepare. Dependencies with other go-live timings. Additionally, as new clinics open, a thorough assessment will be made to determine sequencing impact. "Workflows will be challenging during the 15 months of this transition," said Jeanne Markland, director, ambulatory clinicals build. "At the end, we'll have one system that will make it easier to continue providing the best possible care for our patients." 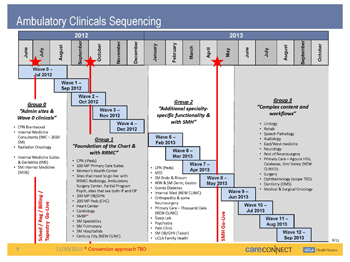 See the CareConnect ambulatory clinic sequencing schedule here. Questions or comments? Send us a message through the Contact Us page on our website or send us an email at CareConnect@mednet.ucla.edu.